You won't see me going to Burger King often, especially for a poutine. Last time I went, I was quite disappointed. I found their gravy too soupy and the fries were soggy. This time, I wanted any poutine and frankly, I was planning on visiting New York Fries, but I was in a rush, so I decided on Burger King. Burger King, like New York Fries, has felt competition from Smoke's Poutinerie, where Smoke's has brought a new creativity to the Quebec staple dish. While New York Fries brought out Butter Chicken and Braised Beef poutines last year, Burger King went a bit simpler with two new varieties. First, the Bacon Poutine, which is as simple as it sounds. Second and lastly, the Angry Poutine. The Angry Poutine is a poutine-take on their popular Angry Whopper, it contains jalapeños, crispy "angry" onions and an "angry" sauce. I decided on the Bacon Poutine, a pretty safe bet. It came in a plastic container that if you didn't open it ASAP, it would have made the entire dish soggy. Thankfully, I scarfed it down immediately. Compared to the previous poutine experience at Burger King, it was better, but not by much. The biggest problem with Burger King's poutine, aside from the fries, is the gravy. Like my previous visit over two years ago, it was salty and tasted like a cheap soup. The gravy ruins the poutine, but at least at this visit, the fries weren't swimming in gravy, thankfully. It's basically what you would expect from Burger King, nothing spectacular or tasty, but if it is the only poutine option in your community, you deal with it. 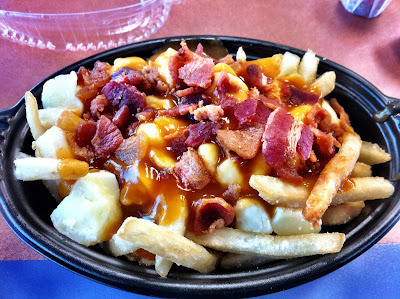 I still wonder if McDonald's will ever sell poutine outside Quebec 'cause hey.. A&W, KFC, Harveys and Burger King all do! As a side note, my favourite Canadian-themed pub in Brandon, MB, Joe Beeverz, has a feature this month of Perogy Poutine. While I may not try it, but that's one of the most Manitoban themed poutines I've ever heard of. Poutine topped with perogies. However, at first I expected perogies to replace the fries for the dish. Bacon Poutine is something that I have yet to try. This is a mouth watering entree that is good with hot cheese.